Always wondered what the list of ingredients on the back of your shampoo bottle really means? We know, the long words and scientific jargon are enough to make anyone’s head spin. But luckily for you, you no longer have to do any fancy guesswork (phew!) because we’re here to shed some light on the matter. Below, we’ve created a simple guide listing all the key ingredients in shampoo and what they actually do for your hair. So get ready to learn the secrets behind your hair care, and prepare to say farewell to your frustrations! 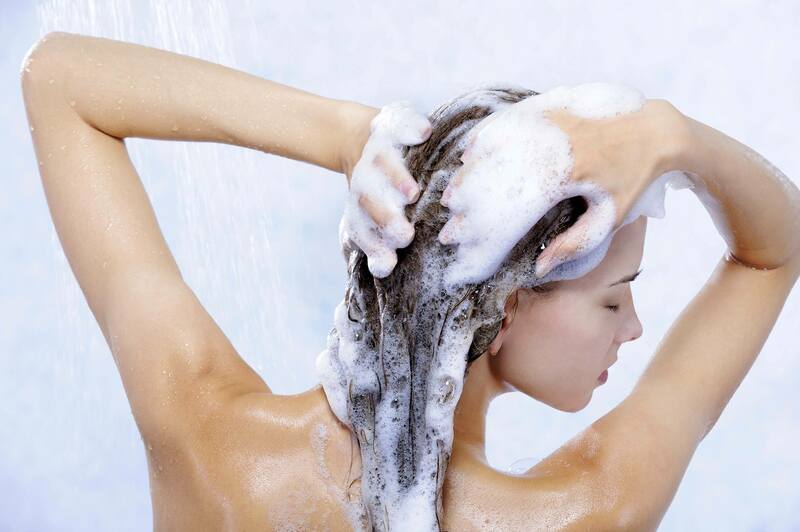 There are two different types of surfactants in shampoo: primary and secondary. Primary surfactants (e.g. SLES) have the main role of cleansing your hair, while secondary surfactants (e.g. CABP) are used to boost sensory qualities of the primary surfactants – or what’s commonly called the lather or foam of your shampoo. 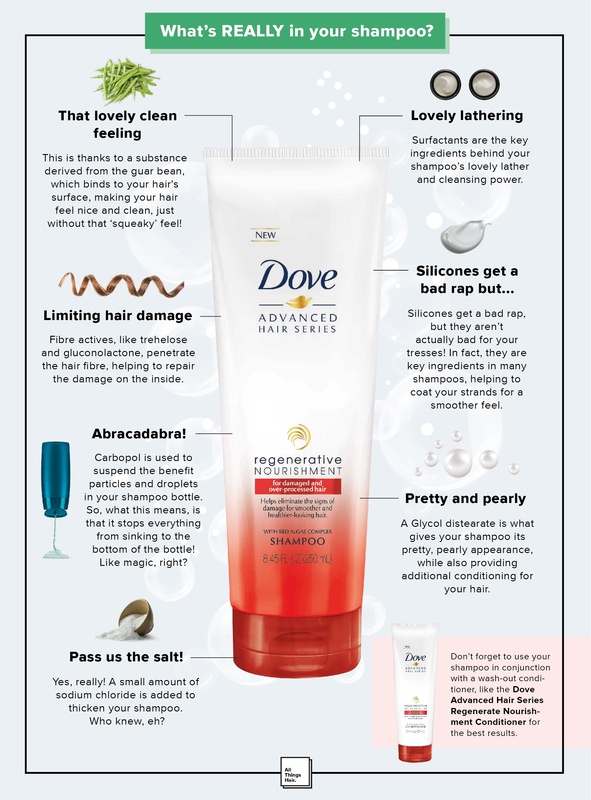 However, in some conditioning shampoos, like the Dove Advanced Hair Series Regenerate Nourishment Shampoo, surfactants also help deposit silicone onto your hair. Always wondered how your hair gets that lovely clean feeling? Well, you can thank the ingredient guar gum for that. This substance is derived from a guar bean, and has been altered so that it binds to the hair’s surface, making your hair feel nice and clean, minus that ‘squeaky’ feel. Nice and clean with a side of lathering! They aren’t actually bad for your tresses! Yep, we’re being totally serious. In fact, they help coat your strands, giving it a smoother feel, which is great if you’ve got damaged hair. Dimethiconol (what a tongue-twister, eh?) is a patented silicone material with a very well-defined droplet size and hardness. “In addition to making the hair feel soft and smooth – which is the key benefit for damage repair shampoos – deposition of silicones on the hair fibre surface also delivers effective fibre alignment. 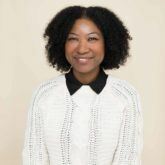 This is key to making the hair look shiny and smooth for straight hair, or delivering well-defined curls for curly hair,” said Peter Bailey, the Global Technical Manager of Hair Care at Unilever. Fibre actives like trehelose, gluconolactone, and adipic acid are small organic molecules in your shampoo that penetrate the hair fibre. They’re used in shampoos (particularly ones for coloured tresses or chemically-treated and heat-damaged hair) to help prevent hair damage, and work by interacting with your structural hair protein to help repair the internal structure. Now that’s what we call damage control! Ethylene glycol distearate, also known by its apt acronym, EGDS, is what gives your shampoo its pretty pearly appearance! So, next time you admire your shampoo as it flows from the bottle, know that it’s due to this lovely key ingredient. But that’s not all. Because it’s a wax-based material, it also provides additional conditioning benefits for your hair. So, as some might say, it’s more than just a pretty face! Carbomer is a polymeric material used to suspend the benefit particles and droplets in your shampoo bottle (we know, it sounds a bit like a magic trick), enabling everything to be evenly dispersed throughout the shampoo formula. So, in layman’s terms, this basically means it stops everything from sinking to the bottom of the bottle. And FYI, it’s water soluble, so it doesn’t leave any deposits in your hair. Hooray! Polyox (PEG) is a water-soluble material in your shampoo that works as a protective layer between the hair fibres during washing and rinsing, yet doesn’t bind to your hair’s fibre surface. Try thinking of it as a temporary ‘cushion’ for your hair. Ah, so comforting! Don’t forget about your conditioner! Salt? Like the stuff you put in your food? Yes, a small amount of sodium chloride is added to thicken your shampoo, so that it doesn’t just run through your fingers when poured into your hands. And before you ask, no, it’s not harmful for your hair! Who knew, eh? Needless to say, that for the best results, don’t forget to use your shampoo in conjunction with a wash-out conditioner. It’ll help to instantly nourish and condition, leaving you with healthier-looking and smoother-feeling tresses! Enjoyed uncovering the secrets behind the ingredients in shampoo? Then don’t forget to head over to our How to wash your hair page for loads more interesting hair care reads! Beautiful locks, we’re coming for you! Have curly or wavy hair? 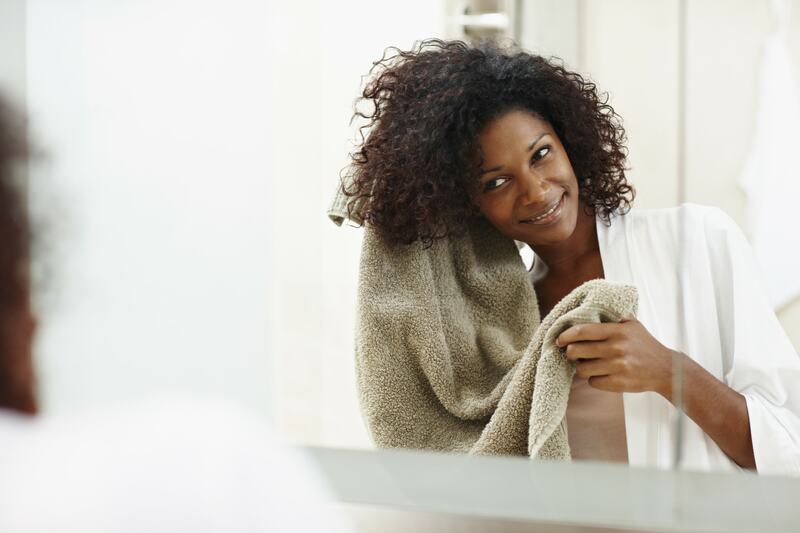 Here's why you need to try a co-wash shampoo!